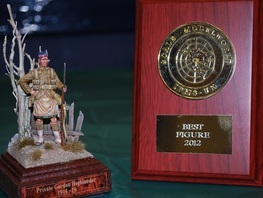 ''Private Gordon Highlander'' By Mike Skelding"
Well it was the first "normal" meeting after the AGM for this years committee and whilst I was nervous as the new chair I can honestly say I thoroughly enjoyed it! In total we had 27 members in attendance including not one but three new members! So on that note welcome Andy, Dale & Shaun and we look forward to seeing your future builds and hope you enjoy it with us! I was also really pleased to see we had some juniors in attendance and must say I was really impressed with their builds, keep it up lads, you give us olden's a run for our money! Next time make sure you get Big Alan to photograph more of them as sure there where more than what I have images of? I was also pleased to announce that Steve Naylor who could not make the AGM was accepted back onto committee as a late amendment, welcome Steve and I look forward to working with you as is the rest of the team. A new addition to the meeting is the club photographic table, this will become a common feature at all meetings so please do take the opportunity to have your models documented for the website, we will also email you any images upon request for your records. Above is one of the first to try it out non other than our very own "Nationals Winner" Mike Skelding who won best figure in show at Scale Modelworld 2012, well done Mike, been itching to get a picture for the website as needs celebrating, better late than never! For those members that could not make it you will be unaware that I have been working on a club 'T' shirt and was pleased to hear it was greatly received as a popular option and now work is under way to look at other garments as requested. The aim being to promote us as a club, keep you warm and to stand out in the crowd, ok so not with any bells or whistles but our new easier to remember website asvc.org.uk will be printed on the backs that is soon to go live, don't worry though as the address your using today will still work! Well that's probably enough for me to go on about, but my final word is to say if you ''the members'' reading this think of any ideas or suggestions you would like to suggest then do jot it down to pop into the suggestion box at the next meeting or email us via the contact us form through this site. Oh and remember we would like to organise a trip to Duxford on the 16th March so do get in touch to register interest as we need to come up with a plan for getting there! Fear not if you cant make it as there are many more plans in the pipeline so watch this space! Anyway, here are some pictures taken from the meeting, well done to all who entered into this months competition also, as always some great models, enjoy and until we meet again, happy modelling!